Chief of Staff Maj Gen James Birungi (L) chats with SFC Commander Maj Gen Don Nabsa during the Tarehe Sita celebrations in Entebbe. "External forces are looking and they don't want us to develop. We have the oil here, beauty of the country, stability, development and above all a precious leader. They think maybe if they get the precious leader out there will be disorganisation. Please don't go on that path, it's a wrong path. Don't let them use you," Maj Gen Nabasa said but did not name the forces. "They won't come physically, but if they come here, it will be the best because we are very ready for them. Unfortunately, they will not come. They will send money and people, like the ones of late being deported, to mobilise the youth because they have the manpower here and the youth are very easy to convince. Please, talk to them and they see that the stability of their country is their future," he added. Maj Gen Nabasa made the remarks yesterday during the 38th SFC and UPDAF (Uganda People's Defence Air Force) Tarehe Sita celebrations at the 10th Battalion headquarters in Entebbe. "Please, anyway, I am sorry. As I have said, I am not supposed to talk politics but since it is an army day, I think I am allowed to speak about what you may term as politics, secondly as General, I can't hide undercover at all now, time has caught up with me and I can't say, 'I will see. No no no. That is what it is'," Maj Gen Nabasa said. "You as parents go talk to your brothers, the youth who don't know how Uganda looked like 35 years ago so that they can be calm. Advise and educate the youth who are being misled. Don't fight them or use an iron hand. It will not work," Maj Gen Nabasa said. He also urged politicians and elders to speak to the youth not to be misled by the external forces which are jealous of the country's stability. "Talk to the people and youth to understand the stability of Uganda is their responsibility and future. Don't think of beginning a war because you don't know where the bullet will go. You are fighting people who have lethal means, how sure are you it won't begin with you?" he cautioned. "Without these civilians, there is nothing we as the army can achieve. I want to thank these civilians who supported us even before going to the bush, up to now to achieve whatever we are achieving," Maj Gen Birungi said. "We still have the firmness that the steady progress of the peace that was restored is never brought down and want to assure you we are not threatened. As a freedom fighter and a person entitled to keep peace, I will not let peace go. 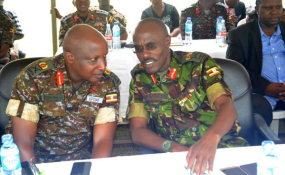 Join hands to ensure that the peace that was restored is not let down," Maj Gen Birungi said. "We need to be cautious about the excitement of the upcoming election. There is a lot of politicking but we have to serve our people until the term ends. We need to keep peace," Ms Tumusiime said.